Here in Australia, we’re lucky that we can, for the most part, get outside every day to engage in some sort of activity. Even during winter, where temperatures do indeed drop, we’re still able to get outside most days, even if it’s just a short walk around the blog. In childcare, outdoor play is a core part of the program. Don’t reserve outdoor play for summer only: we’ve collected some of our favourite activities and games you can test throughout the year! What ideas can you take away to test on your own centre as you complete childcare placement? We want kids to have fun, so choose activities that will entertain little ones and get them moving. Outdoor activities don’t need to be (and in fact shouldn’t be!) complicated. Keep it simple. Of course, safety is your number one priority for both indoor and outdoor activities. Hold young ones’ attention through quick-paced, easy to understand games. Here are some examples of outdoor games and activities that require almost no set up and can be undertaken with little planning! This activity requires no setup! Gather a small group of children together and ask them to listen carefully. Can they identify what they can hear? As time goes on, they will notice even the most mundane of noises, including a car driving by or a dog barking in the distance. You could also try this with smells, colours, and textures! Think the feel of the sand from the sandpit in your hands, the texture of the tree trunk, or the cool, smooth touch of grass. This activity is, again, so simple and requires no special equipment. 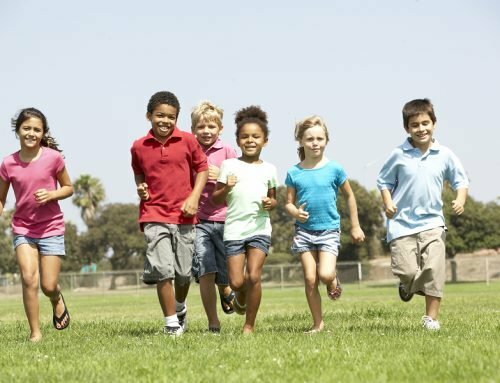 Get kids to practise a variety of movements, including hopping (on each foot), jumping, skipping, and more. Not only will this help them achieve their physical activity for the day, but will also strengthen their gross motor skills. You could lay a thick board of flat wood on the ground, encouraging each child, in turn, to make their way across the board in a special way – maybe they’d like to try hopping from one end to the other? Keep this activity moving at a fast past so they don’t get bored. Help them cheer on and encourage their friends as they make their way over the board. 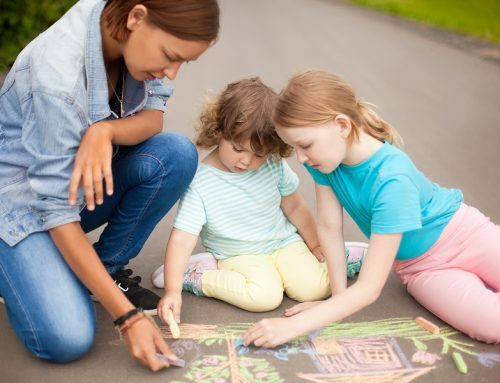 If your centre has an enclosed asphalt area within its grounds, get some chalk, hand it out, and let children go wild! Where did you get the idea to draw this? What is your favourite part of the drawing? Better suited to smaller groups, provide kids with some magnifying glasses and let them explore! They can investigate plants, flowers, leaves, insects, and more. 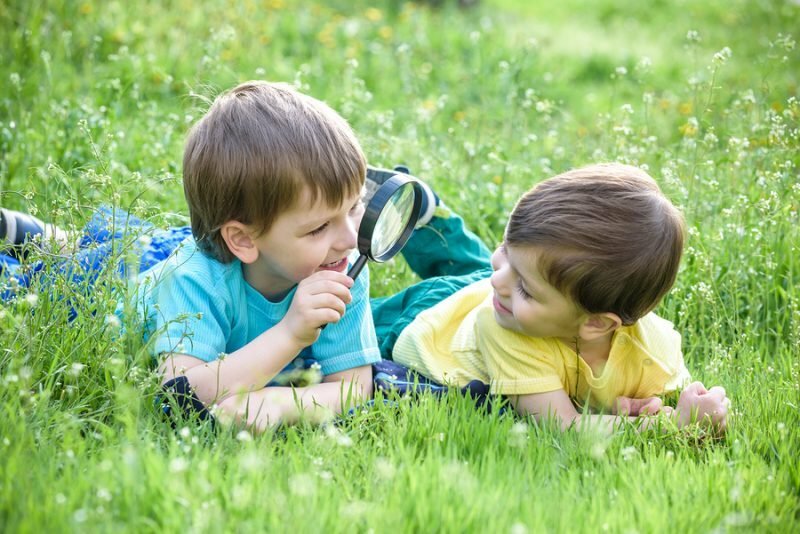 You’d be surprised how much the dimension of an outdoor area changes once little ones are armed with a magnifying glass! You can ask them to describe what they see, or as an alternative, ask them to draw what they investigated. The simplest ideas are often the most effective, but it can indeed be difficult to focus on simplicity! You might feel pressured to come up with extravagant ideas, but remember, all kids need is a little guidance and encouragement, and they will, without even knowing it, start leading the activity! Do you think you could incorporate some of the above suggestions during your childcare placement? 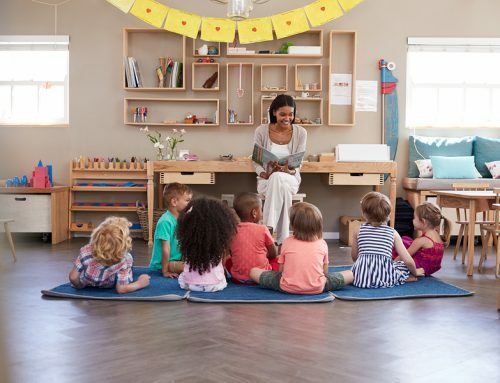 If you’re looking to take the first step towards a rewarding and joyous career in childcare, make sure you explore our childcare courses here. If you’d like to chat to a career consultant, contact us or call us today!